Mike Trizano had reached a crossroads in his mixed martial arts career. It was a little early for such a situation, but it was a crossroads nonetheless. Sporting a perfect 6-0 record that included a win in Bellator and several victories for the Ring of Combat promotion, the New Jersey prospect was obviously on the right track to the UFC, but why not speed up the process through The Ultimate Fighter?? His coach had some reservations, though. That’s fighter talk. Then he heard some more of it from his Tiger Schulmann MMA teammate and current UFC bantamweight contender Jimmie Rivera, who took the long road to the Octagon. “He (Rivera) said, ‘If an opportunity comes up, you’ve got to take it,’” recalled Trizano, who got the blessing of his coach and took the trip to Las Vegas for the TUF 27 tryouts. A member of Team Miocic on the reality show, Trizano will fight for the first time in the competition on Wednesday night against Thailand Clark. Needless to say, it’s been a trip watching himself on TV each week. 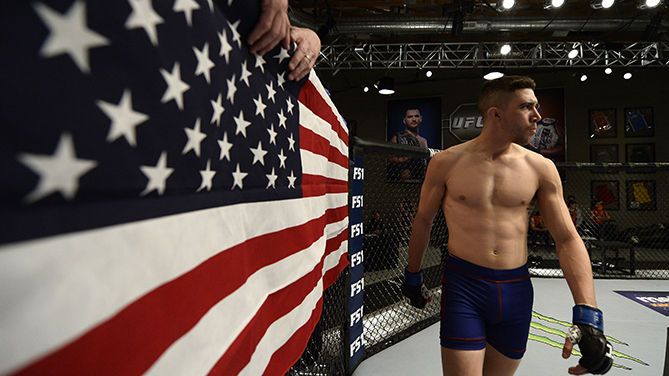 Other reality shows won’t take a prizefighter from the local scene and put him in the big show, but TUF can. And if Trizano does get to the UFC, he will join teammates Rivera, Shane Burgos and Julio Arce as members of a squad that once got denigrated for having a great marketing plan. These days, that’s not the case anymore. And while he won’t have his teammates behind him while on TUF, as soon as he gets back to his post-TUF business, watch out. Add in his girlfriend and parents that actually encouraged him when he was thinking about leaving school and taking a run at his MMA dreams, and the 26-year-old is a living, breathing and fighting reminder that while this is an individual sport under the bright lights, to get there, it takes an army.